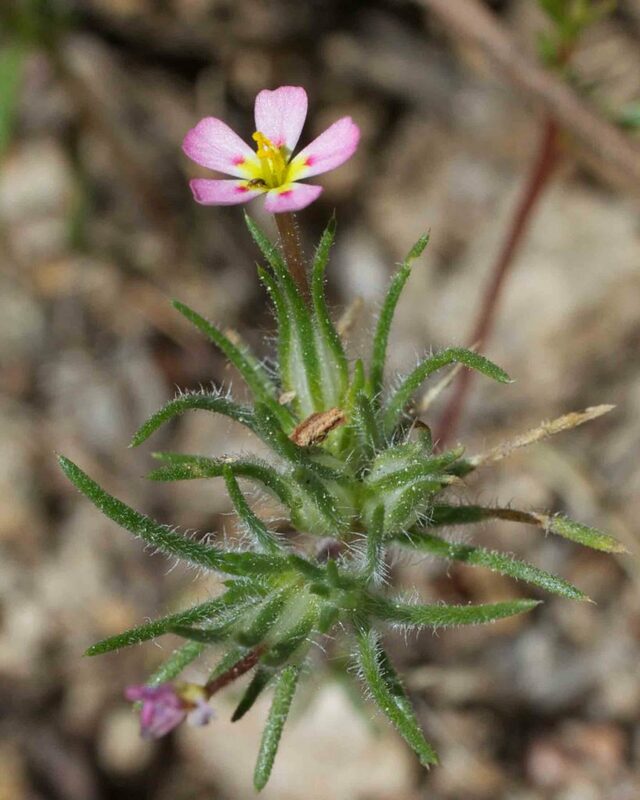 Linanthus used to include what are now separated into two genera, Linanthus and Leptosiphon, depending upon whether or not the flower tube is exserted from the calyx. 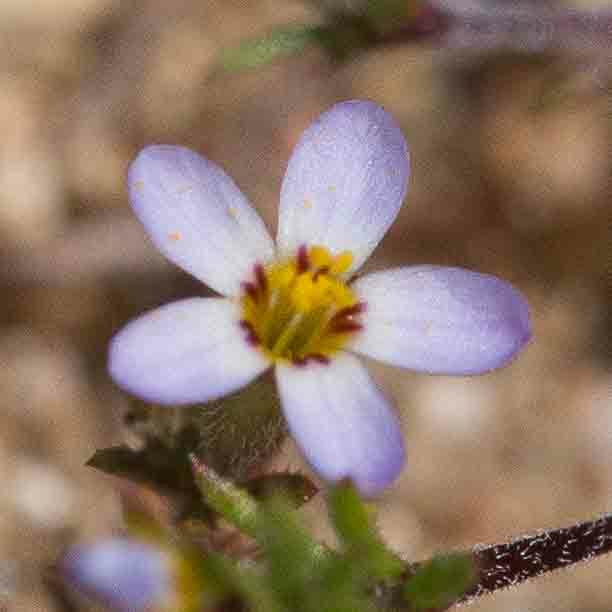 The common name Linanthus may apply to members of both genera. 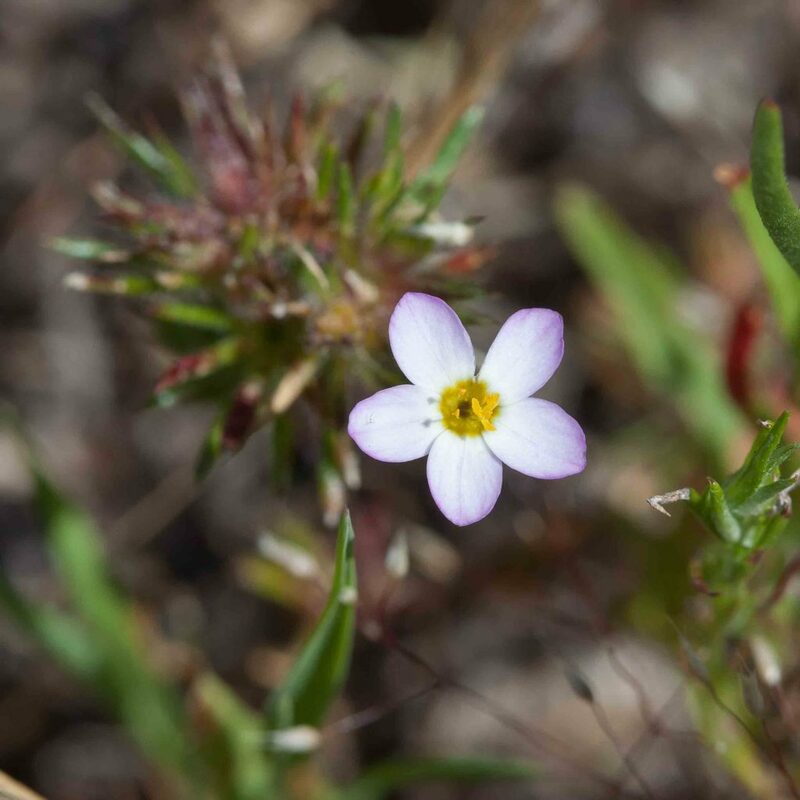 This small linanthus has small flowers, < 1 cm across, which may be white or pink. 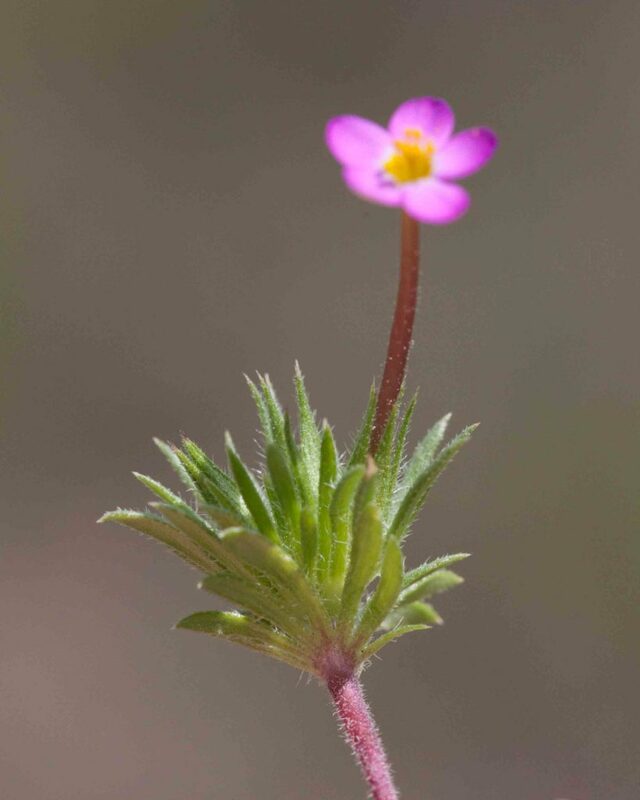 The corolla tube (part of the flower, not a pedicel) is reddish, 12–32 mm long. The throat is yellow. 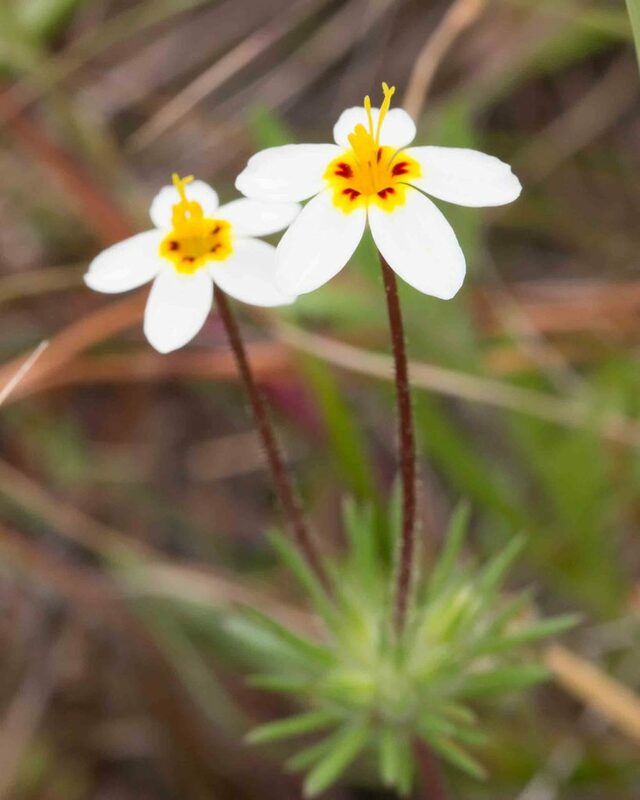 The stamens and style are not as exserted as those of Variable Linanthus (Leptosiphon parviflorus) and the 1 mm long stigma is much shorter. 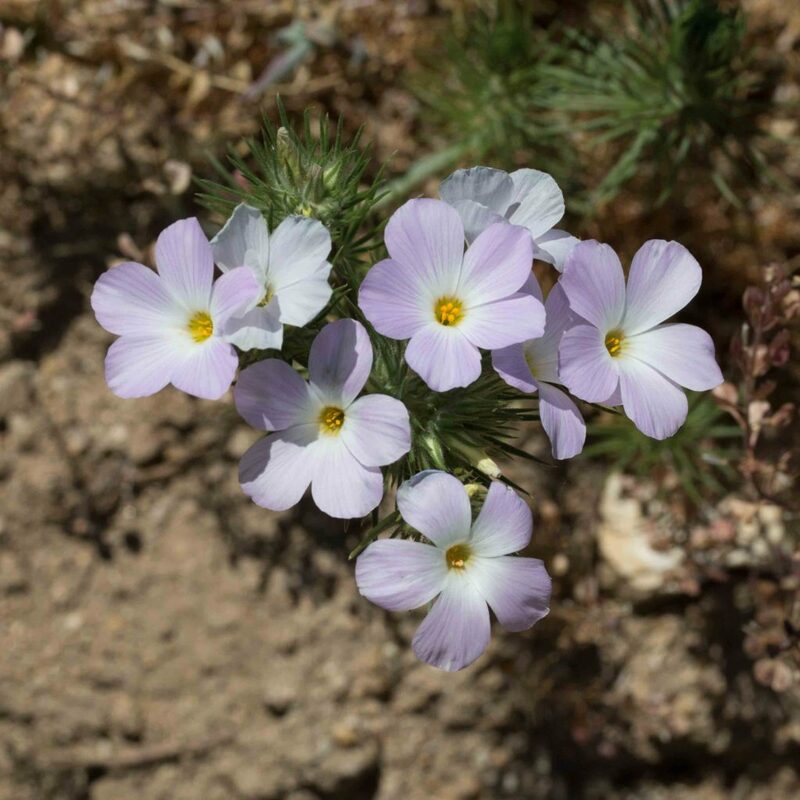 Like other linanthus, the leaves are whorled. 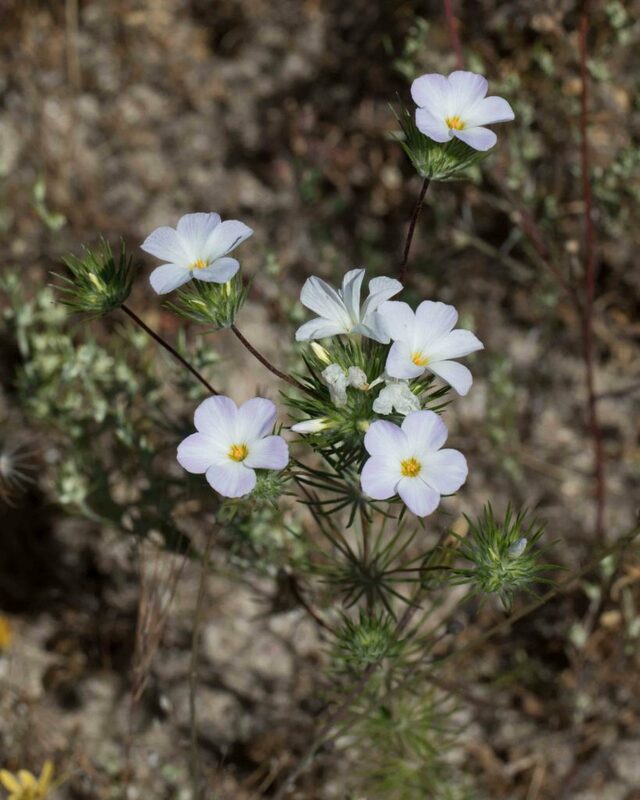 This is the most common linanthus and is similar to though larger than Bicolored Linanthus (Leptosiphon bicolor). The corolla is about 10–15 mm across, usually white but not infrequently pink or purple, often with red marks at the base of the lobes. 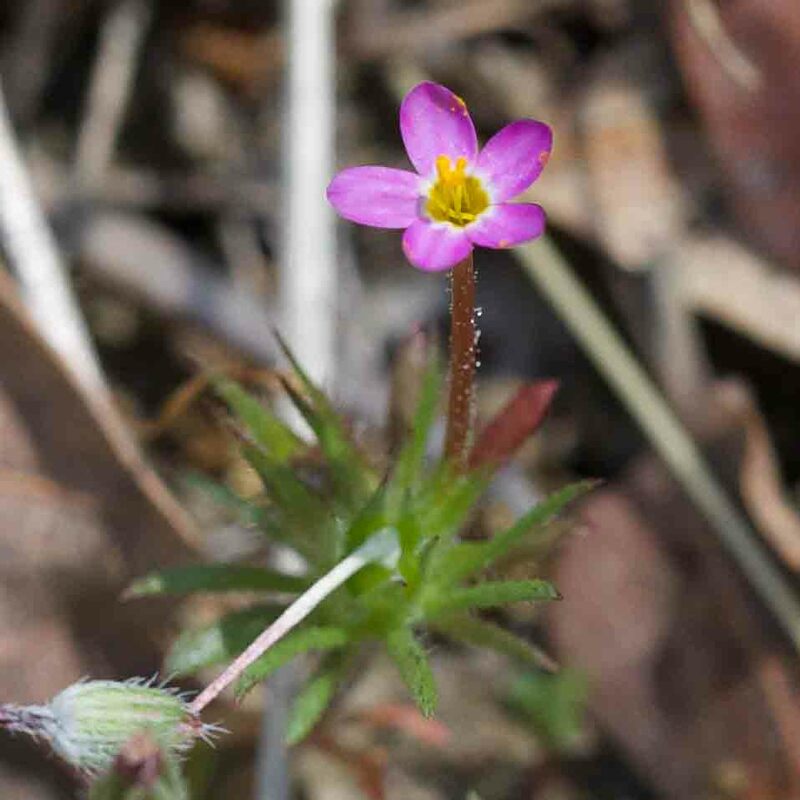 The corolla tube (not a pedicel) is 11–46 mm long and may be maroon, pink or yellow. The throat may be either yellow or deep maroon. 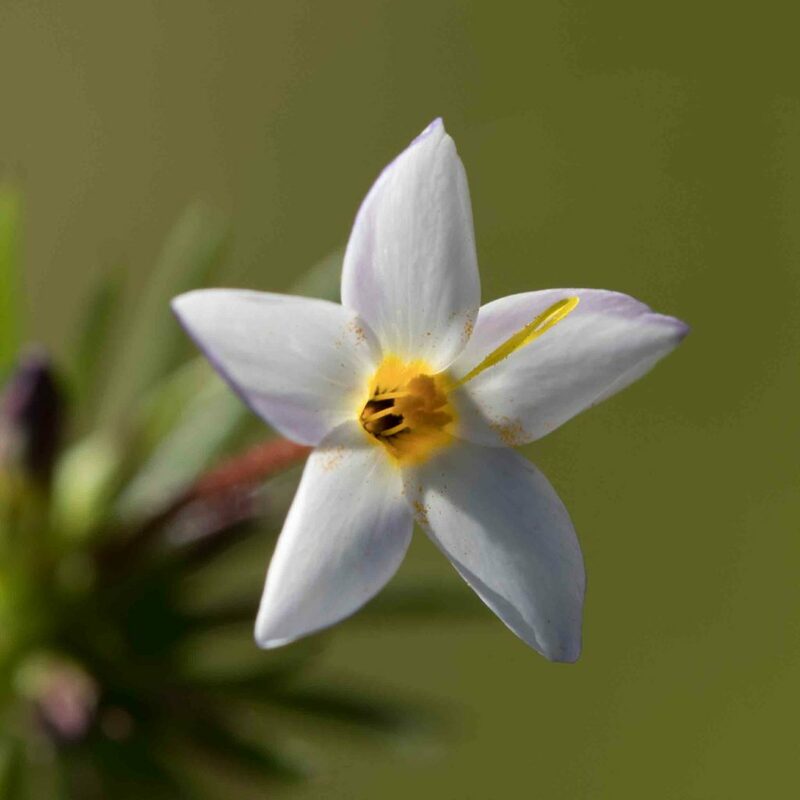 Note the prominent, 1–7 mm long, exserted stigma. 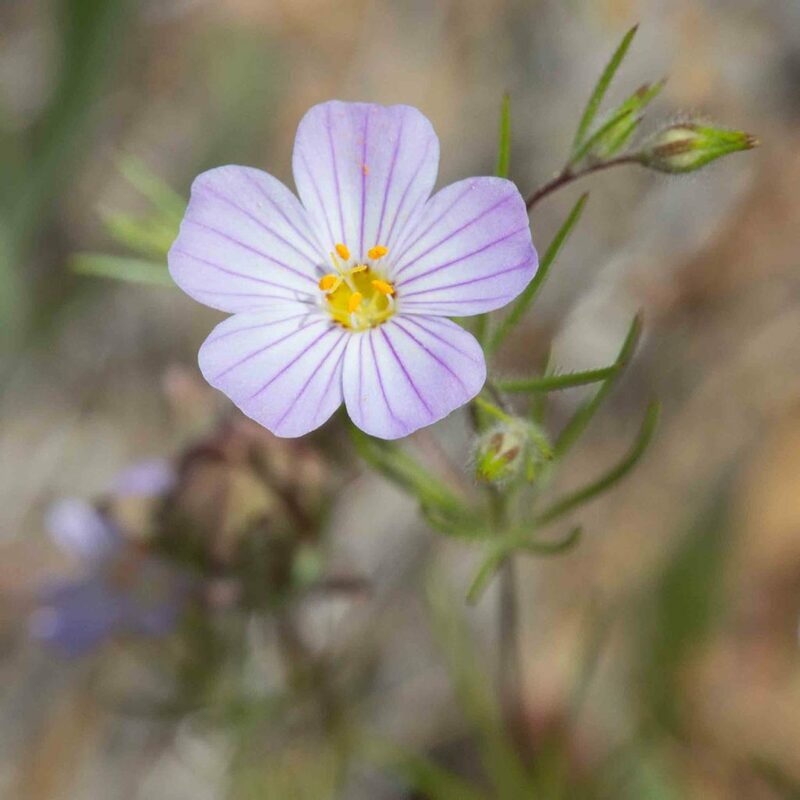 Like other linanthus, the leaves are whorled. 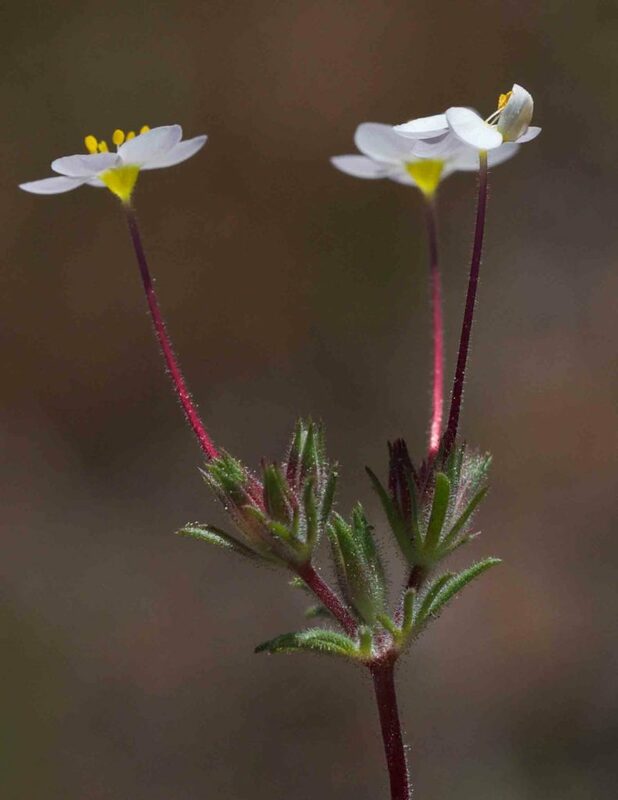 This is the very similar in color and appearance to Variable Linanthus (Leptosiphon parviflorus) and most easily distinguished by its calyx which is not densely hairy like Variable Linanthus but merely ciliate (with marginal hairs) and more or less glabrous beneath. 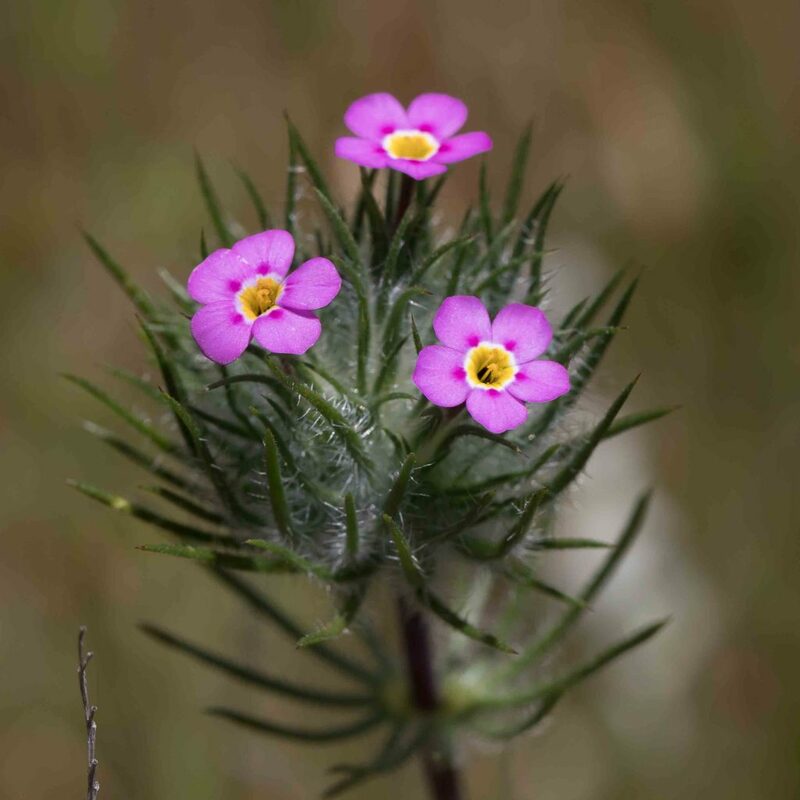 The corolla is a little larger, generally a little over 16 mm across, usually white but not infrequently pink or purple, though lacking the red marks at the base of the lobes which are sometimes found on Variable Linanthus. 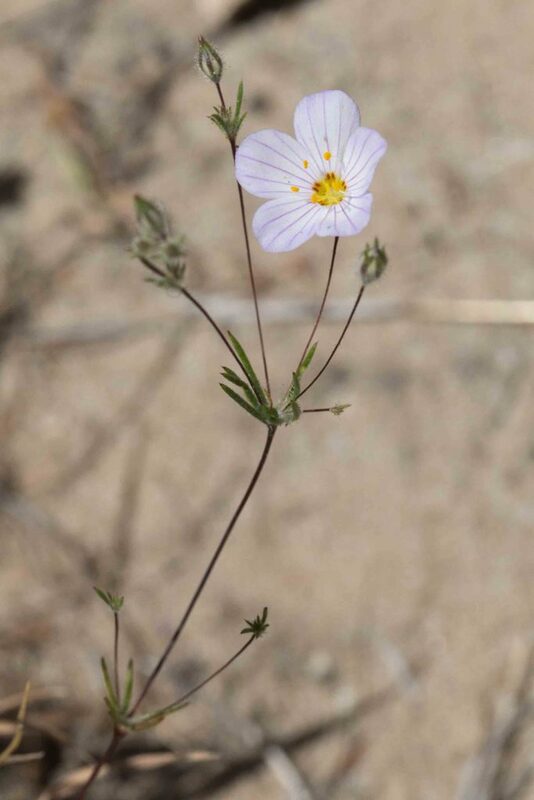 The corolla tube (not a pedicel) is 10–33 mm long generally pink to lavender. 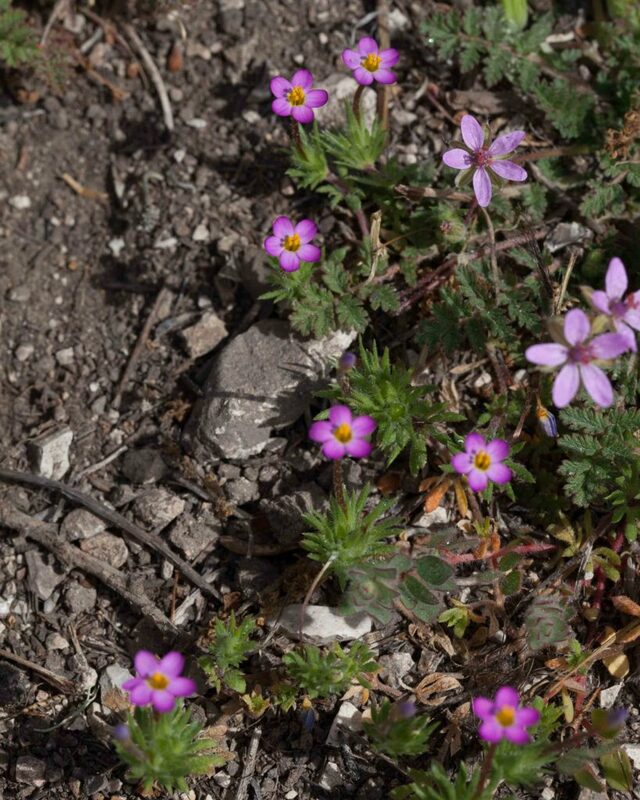 The throat is generally violet at the base and yellow above. Note the prominent, 6 mm long, exserted stigma. 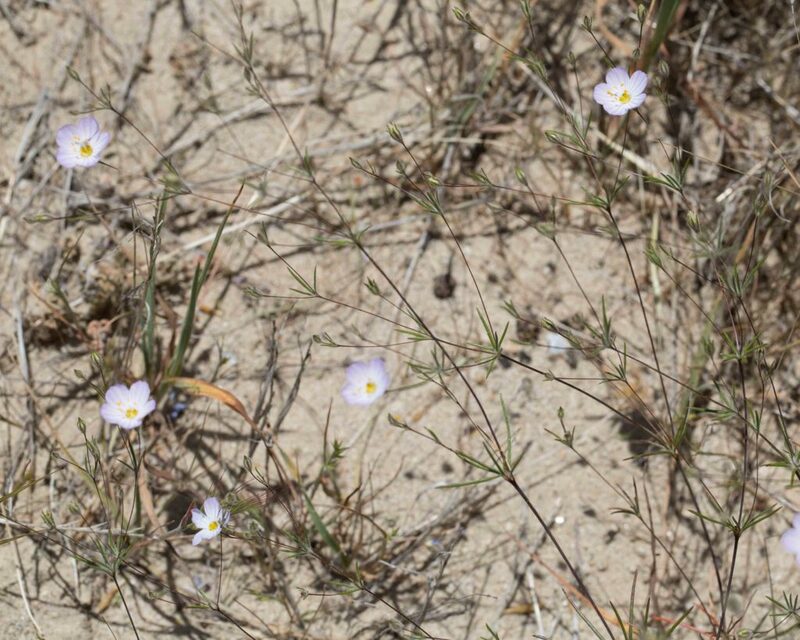 Like other linanthus, the leaves are whorled. 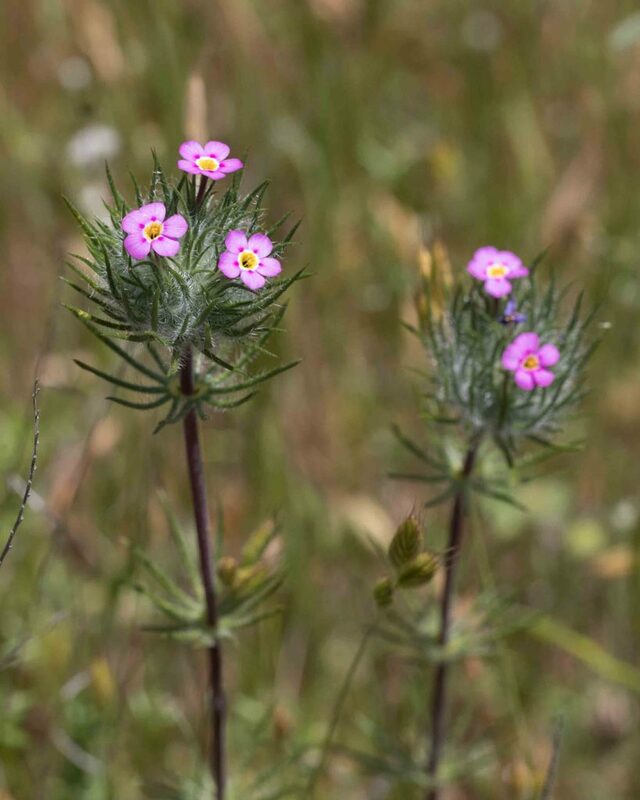 It is believed to be present in Monterey County only on Fort Ord. 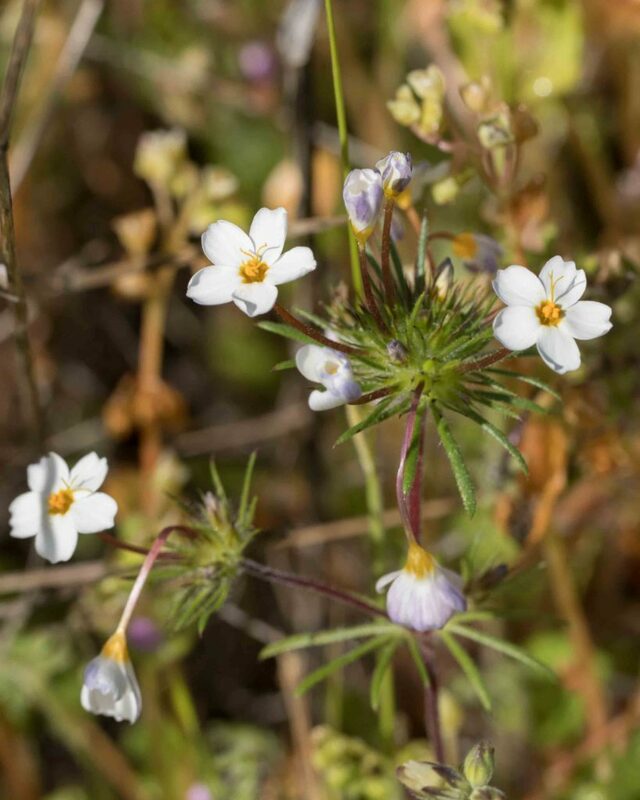 Unlike Variable and Bicolored Linanthus (Leptosiphon parviflorus & bicolor), Whisker Brush has its flowers in dense, white-hairy, bracted heads, not to be confused with the whorled leaves lower down the stem. The corolla is pale to dark pink with a darker pink or red spot at the base of each lobe. 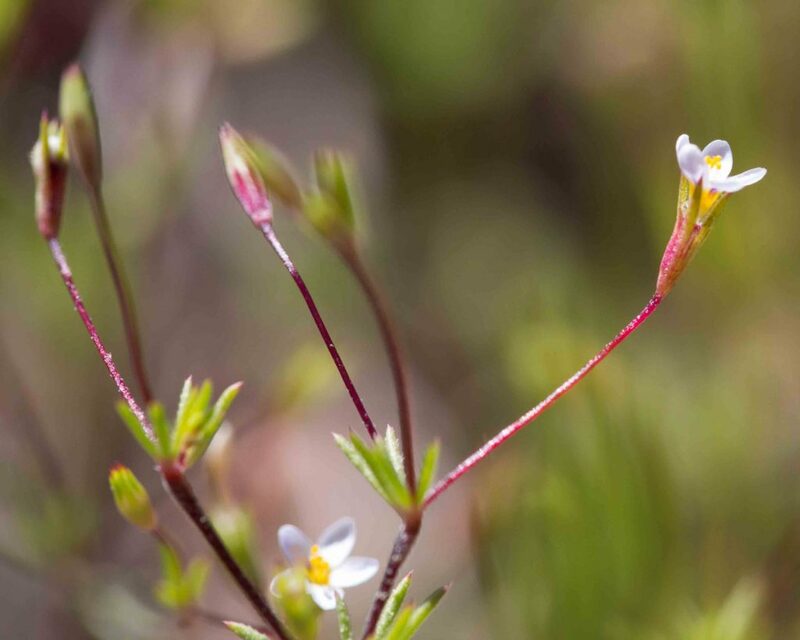 Corolla lobes are 2–4 mm long, rarely more than 1/5 the length of the corolla tube. Unusually the membrane connecting the calyx lobes is broader than the lobes themselves. 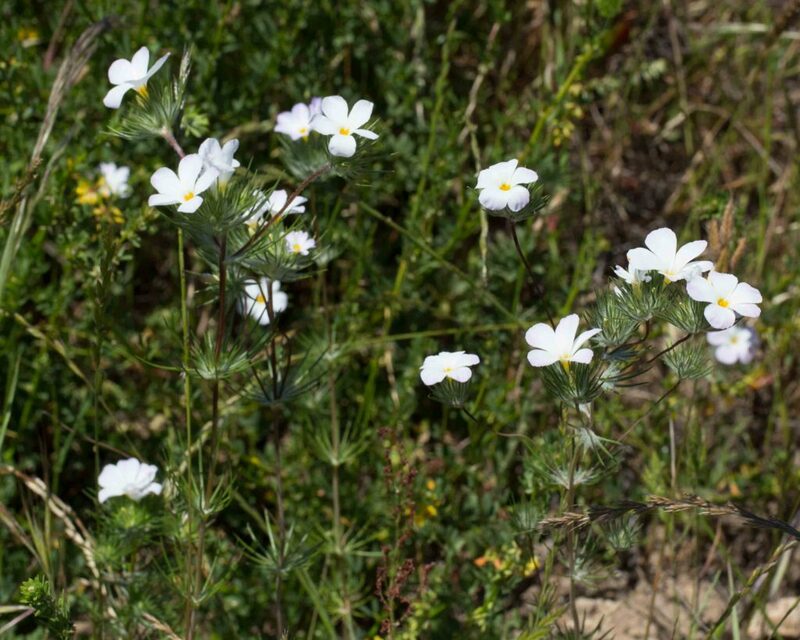 This has much larger flowers than Variable Linanthus (Leptosiphon parviflorus), and generally has multiple flowers in a single head. 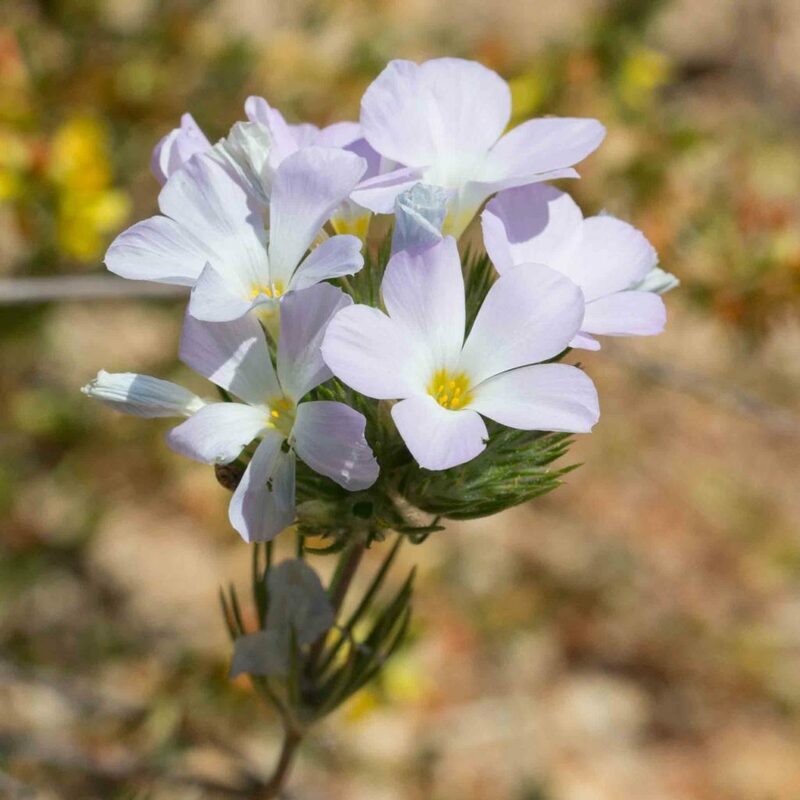 Corollas are generally white but may be lavender, sometimes on the same plant. The throat is yellow. Stamens and style are not exserted. 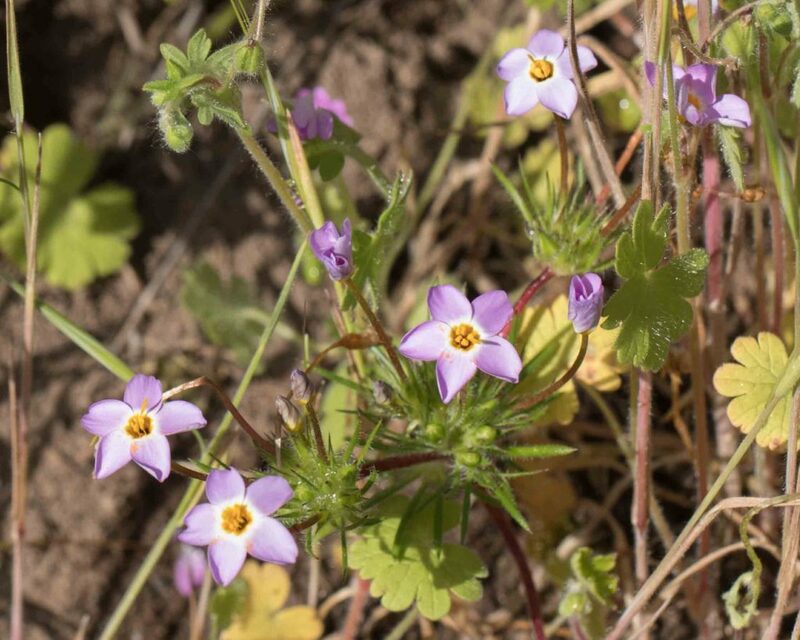 Leaves are whorled in the typical linanthus style. 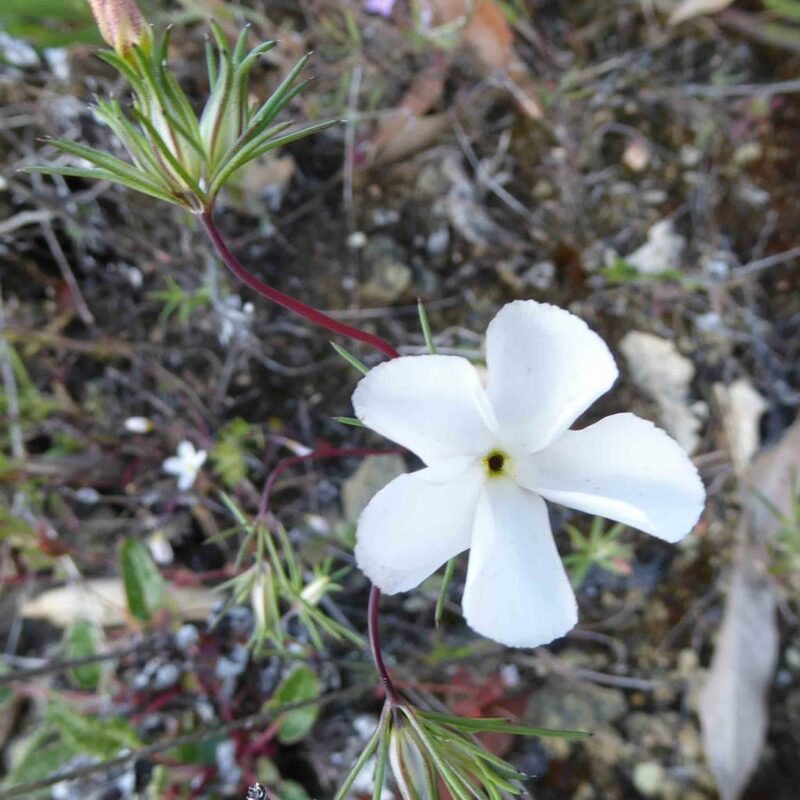 This plant is open and diffusely branched on a single stem. 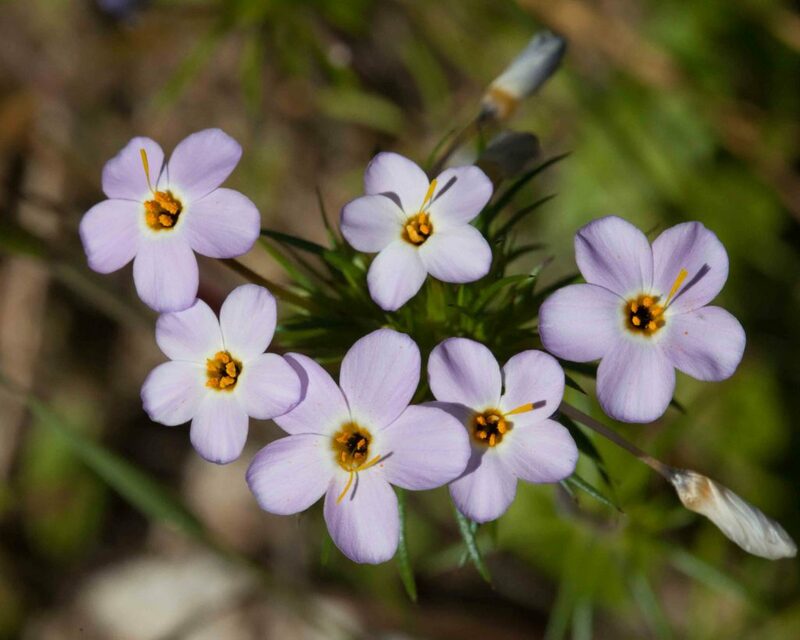 Flowers have white to pale blue lobes with purple veins and are on a thread-like, 1–3 cm long pedicel. 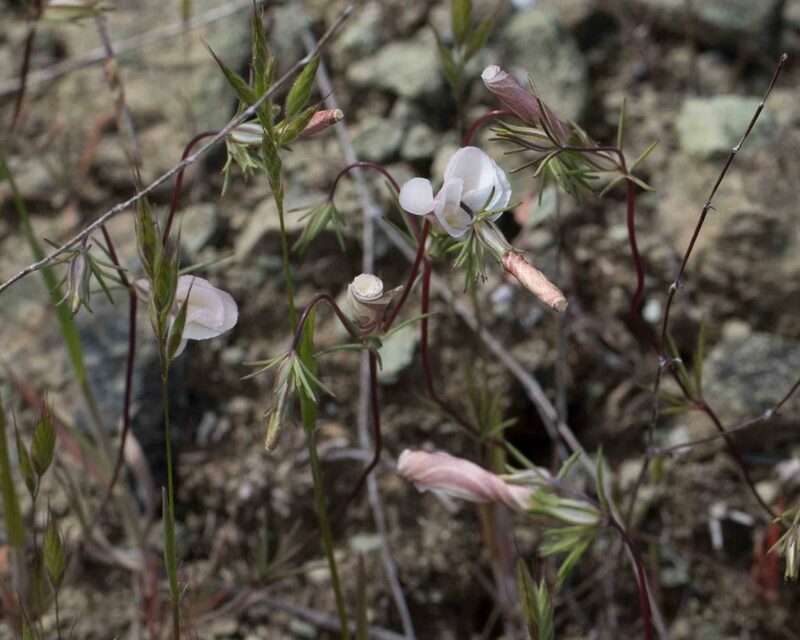 The flower tube is very short with a wide throat that is longer than the tube. 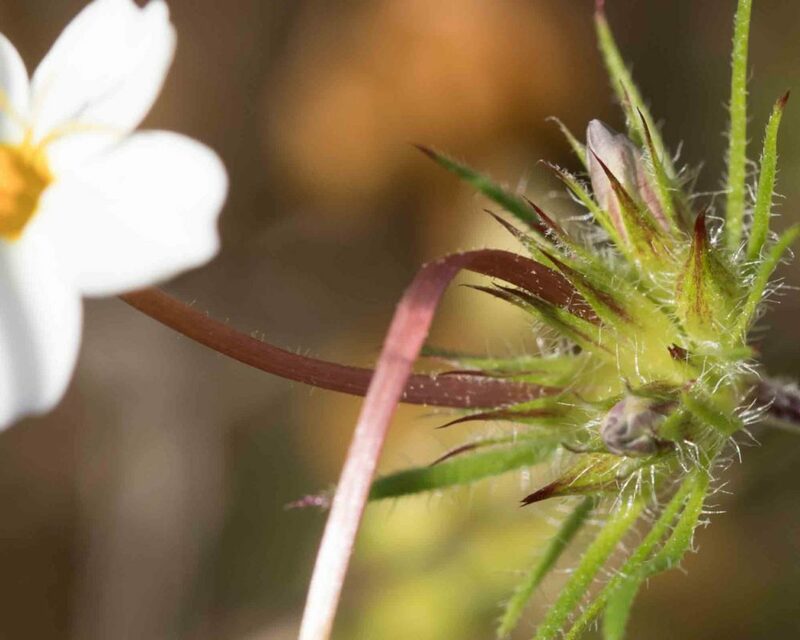 Stamens are exserted and hairy at the base. Leaves are deeply lobed into linear segments. Very common in the Indians. 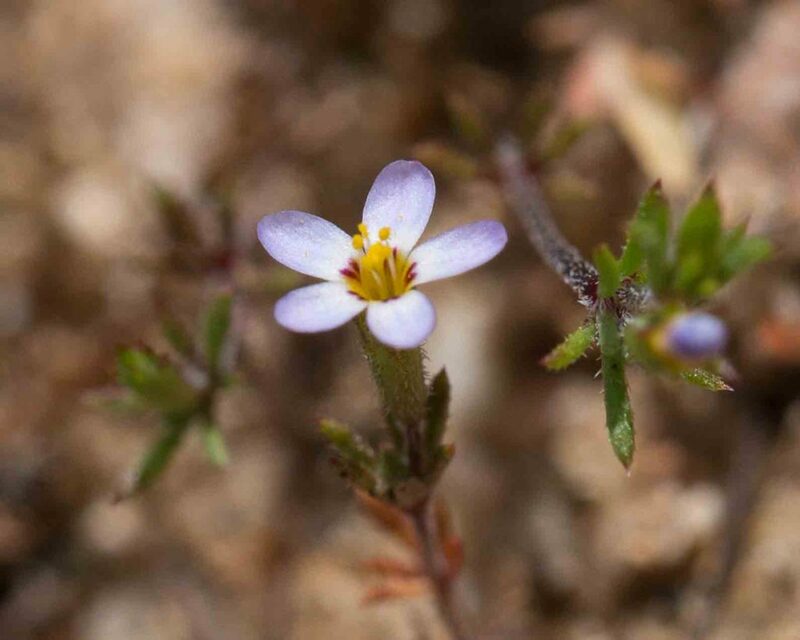 This is a seriously small plant with tiny but exquisite flowers, no more than 5 mm across with a corolla tube < 3 mm long. 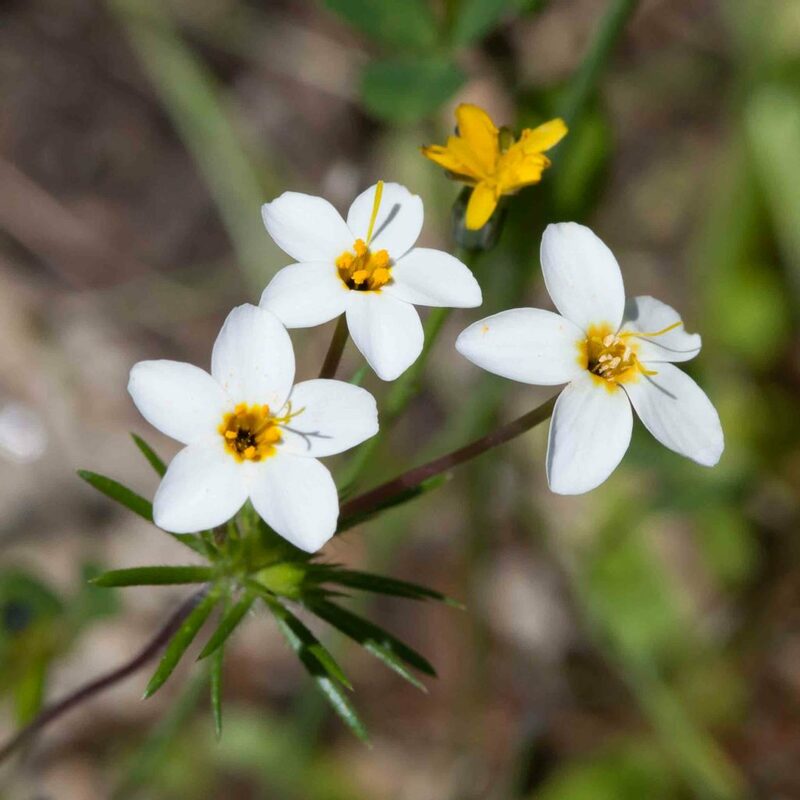 The flowers are widely spread with a solitary flower at the tip of capillary pedicels, 4–15 mm long. 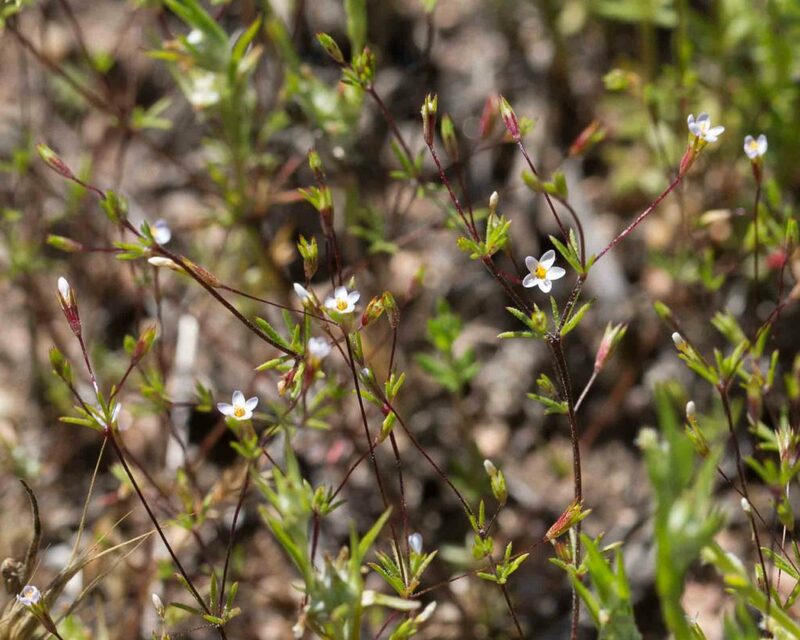 The plant may be widely branched with very delicate stems. 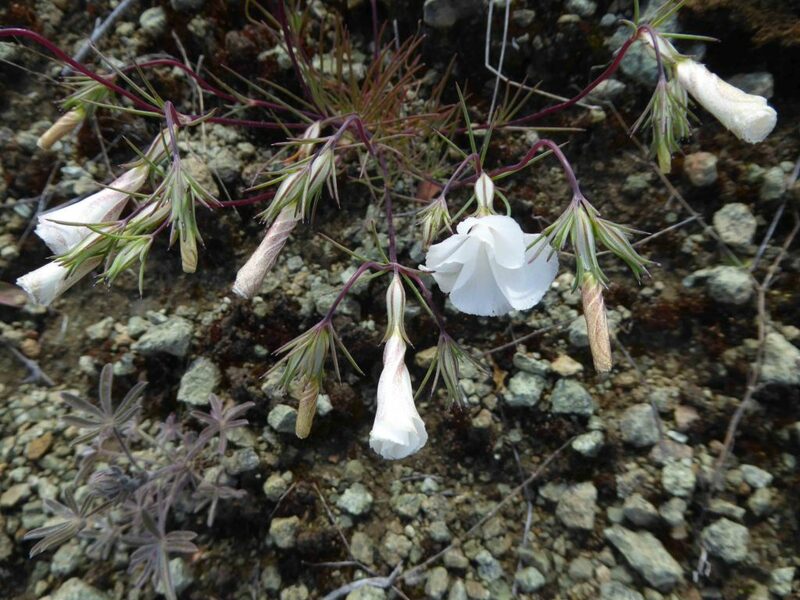 Aptly named, the flowers of this plant do not open until early evening. 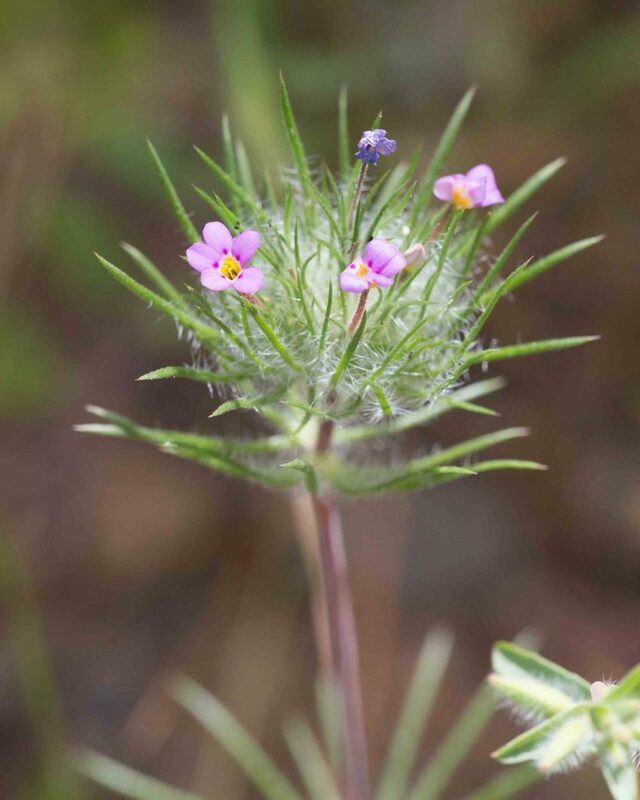 The plant produces several thin waxy stems with clusters of flowers which remain tightly furled like a diminutive cigar until early evening. 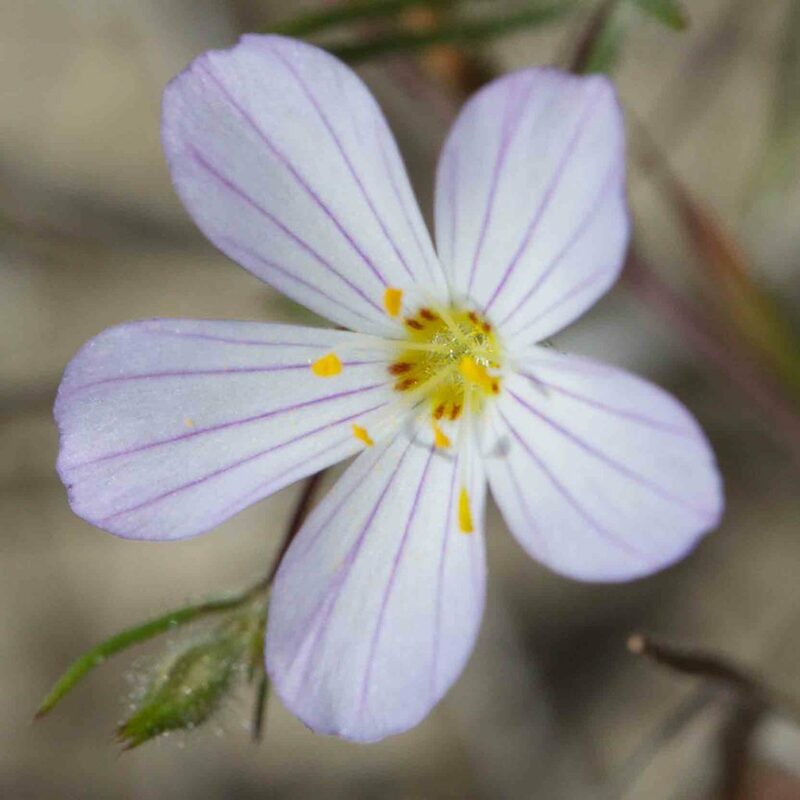 When fully open, the flowers are similar to those of Large-flowered Linanthus (Leptosiphon grandiflorus), only pure white with purple shading on the undersides. 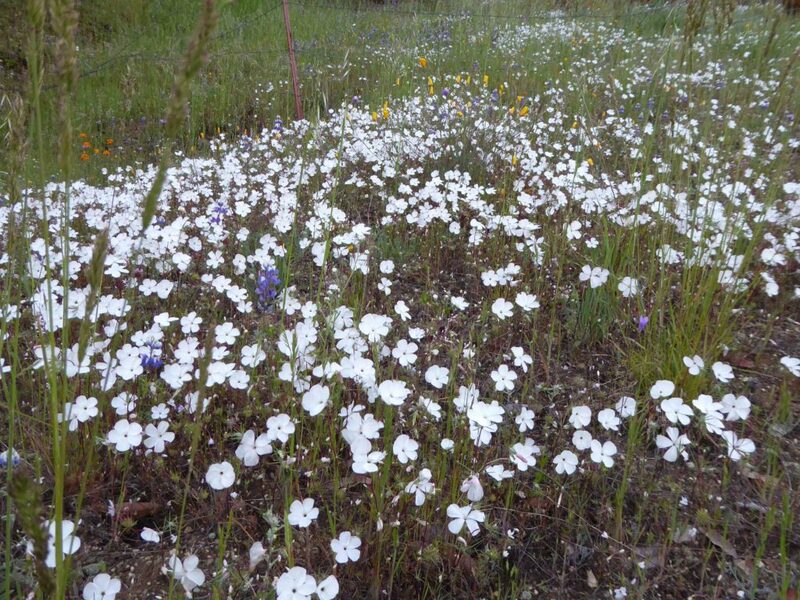 All but the photo on the right are by Bruce Dormody and reproduced with his permission.